UCLIC Research Seminar 5th December: Ana Tajadura-Jiménez (Universidad Carlos III de Madrid & UCLIC) on "The Hearing body: Body-centred sound technologies for emotional and physical health"
People, through their bodily actions, engage in sensorimotor loops that connect them to the surrounding world and to their own bodies. The incoming sensory information is integrated to form perceptions of one's own body appearance and capabilities. These body perceptions highly impact on people's self‐esteem, emotional state and behavior. In her talk, Ana will talk about how neuroscientifically grounded insights that body perceptions are continuously updated through sensorimotor information may contribute to the design of novel body-centred technologies to support people's needs and for behaviour change. Ana will present their work on The Hearing Body project on how sound feedback on one's actions can be used to alter body perception, and in turn enhance positive emotions and change motor behavior. She will also present their current project MagicShoes aimed to inform the design of wearable technology in which sound-driven changes in body perception may be used to enhance behavioral patterns, confidence and motivation for physical activity. Ana will discuss how apart from the focus on real-life applications, novel technologies for body sensing and sensory feedback may also become a research tool for investigating how emotional and multisensory processes shape body perception. She will conclude by identifying new challenges and opportunities that this line of work presents. 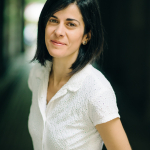 Ana Tajadura-Jiménez is a Ramon y Cajal research fellow at Universidad Carlos III de Madrid (UC3M) and honorary research associate at the University College London Interaction Centre (UCLIC). Her research focuses on understanding how sound-based interaction technologies could be used to alter people's perceptions of their own body, their emotional state and their motor behaviour patterns. This research is empirical and multidisciplinary, combining perspectives of psychoacoustics, neuroscience and HCI. She is currently Principal Investigator of the MagicShoes project, which aims to inform the design of technology to make people feel better about their bodies and sustain active lifestyles. She is also part of the H2020 STARTS initiative that funds collaboration of the Arts with Technology. Prior to this she obtained a PhD in Applied Acoustics at Chalmers University of Technology (Sweden). She was a post-doctoral researcher in the Lab of Action and Body at Royal Holloway, University of London, and an ESRC Future Research Leader and Principal Investigator of The Hearing Body project at University College London Interaction Centre (UCLIC).